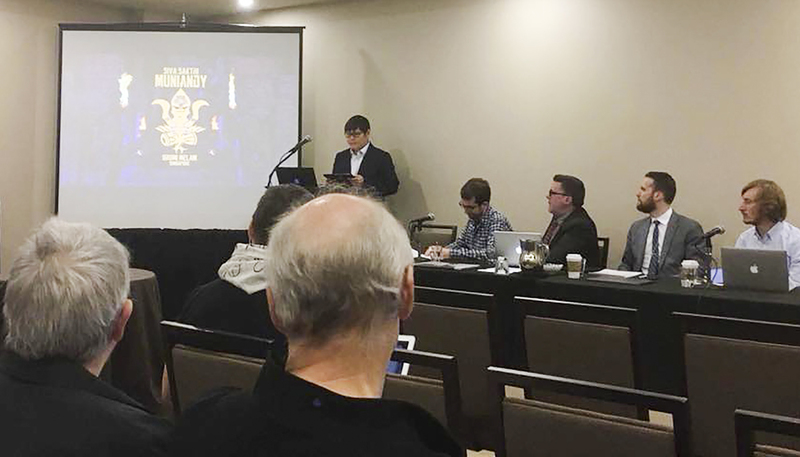 From Oct. 26 to 29, the Society for Ethnomusicology held its 62nd annual meeting in Denver, Colo. University students and recent alumni attended the event, and several read their academic papers to those who attended the meeting. The Society for Ethnomusicology explains its mission on its website. Their website also defines the study of ethnomusicology. The website also notes that ethnomusicologists approach music from a global standpoint, considering it a cultural practice steeped in history, tradition, origin, style, and genre. In addition to Sonderegger, Ellen Lueck, who received her master’s degree from the University in 2012 and her PhD in 2017, also attended the conference. During the conference, she presented an abstract from her paper, “Proposing a Theory for a New Space, the Affinity Interzone.” The research revolves around the “Affinity Interzone,” a term Lueck applies to a portable space constructed to create a generalized, ubiquitous understanding of a genre of music within a community, including the way it’s performed in various locations. Lueck said the paper was well received at the conference, and that she hopes to present it elsewhere. She also plans to later write an article on the subject in 2018. In addition to Lueck, PhD Candidate Gene Lai presented his paper, “Uniquely Singapore: Revitalizing a Tamil Folk Music Tradition in the Lion City.” In his paper, Lai addresses “musical sustainability” in reference to Urumi Mēlam, a Tamil folk drumming ensemble from Tamil Nadu, South India. Lai explained that his presentation, despite a time slot at 8:30 a.m., had an impressively high attendance, including major authorities in South Asian and Southeast Asian music. Lai is currently working on forming a Singapore-themed panel for the 5th Symposium of the International Council for Traditional Music Study Group on Performing Arts of Southeast Asia. The symposium will be held in Kota Kinabalu, Sabah, Malaysia in 2018, from July 16 to 22. Visiting Assistant Professor of Music Kate Galloway also spoke at the conference, chairing a panel titled, “Nature: Meaning, Climate, and Embodiment.” The panel discussed issues of place, climate, human and nonhuman performance, and the elements used in said performances. She also organized and chaired a meeting on future projects that the Special Interest Group in Ecomusicology, an organization within the larger Society for Ethnomusicology. Galloway discussed her current academic work at Wesleyan, which explores environmental politics in experimental music and sound art. “I’m exploring how North American artists of the 20th and 21st centuries use analog and digital technologies to sample, remix, manipulate, remediate, among other processes of sonic transformation, to challenge how pressing environmental issues and aesthetic experiences are conventionally communicated to the public,” Galloway explained to The Argus in an email. Galloway appreciated the conference, as it allowed her and others to share their research, gain feedback, and expose each other to new ideas. “I find it particularly useful for teaching because I have the opportunity to hear the most current work in the field and I can then incorporate it into my undergraduate and graduate teaching,” she wrote.